Preheat oven to 400 degrees (425 degrees for high altitude). Coat muffin cups with non-stick spray or use muffin liners (though I do spray inside those, too, when I use them). In a bowl, combine all dry ingredients. 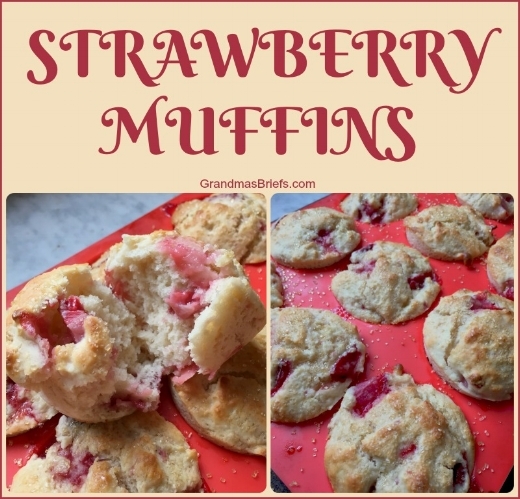 In smaller bowl, combine all wet ingredients except strawberries then add to dry ingredients, stirring quickly by hand just until evenly moistened but not smooth. Gently stir in strawberries until evenly distributed. Batter will be fairly thick. Fill muffin cups about 2/3 full (or a smidgen more; batter is thick and won't overflow cups). Bake 20-25 minutes or until muffins are golden, top and bottom. Remove from oven and immediately sprinkle with cane sugar crystals as desired. Cool slightly then devour. Refrigerate leftover muffins, microwaving 10-15 seconds or so before eating as these are best served warm (though still yummy straight from the fridge, too). *To make sour milk, put one tablespoon cider vinegar in a measuring cup then add milk to equal one cup; let stand five minutes.